Know the renewal of life. March is the month of Sap Moon when tree sap starts to creep up and out to the ends of branches to wake up new budding seeds. 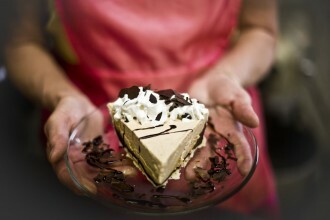 Moon times speak of food times and being close to what’s happening in the place we occupy on our planet. This morning, early and surprisingly I hear Canadian geese honking and the musical trill of red wing blackbirds both sure signs of seasonal change and the annual invitation to deeper connection in this place. 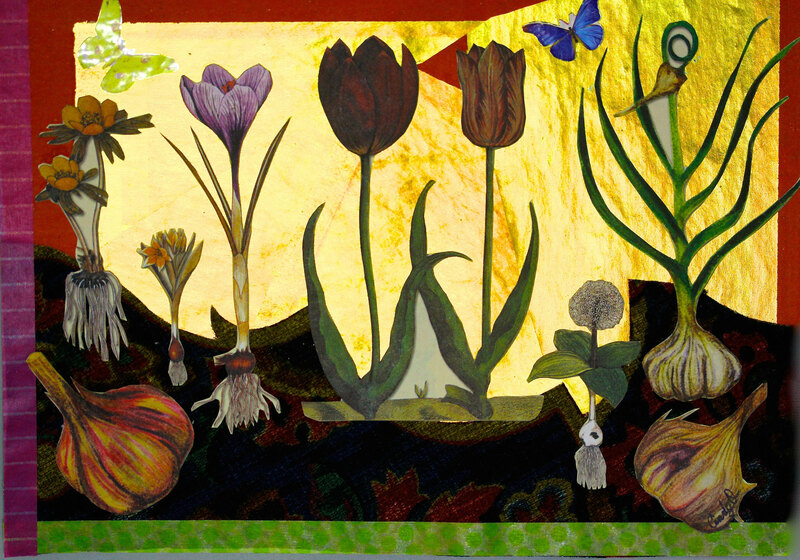 Sap Moon illuminates the joy of the possible just as a collection garden seeds embodies food abundance and creativity. In Hopiland, northern Arizona, way south of Montana, it would be time to shatter the seed pot to reveal a year’s collection of seeds so spring planting could begin. 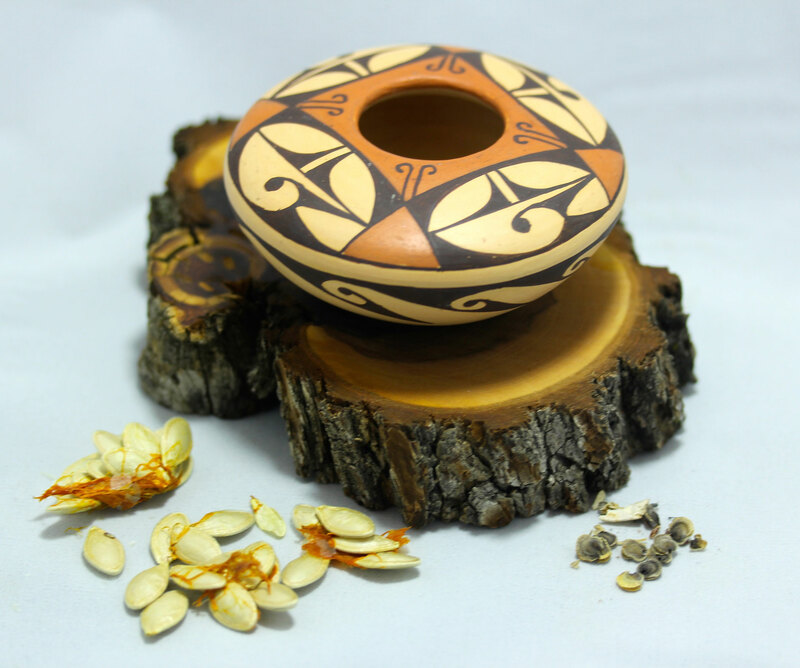 A traditional seed pot is an ingenious hand-formed clay pot with a tiny opening to allow seeds to be saved away from the attention of rodents. A gift from friends, this lovely seed pot lives with me as a reminder that the seeds I collect will be a celebration of my connection to mother earth through the food they ultimately turn into. Another perhaps more commercial reminder of the time for seed gathering is the stack of seed catalogs that come to our mailbox this time of year. 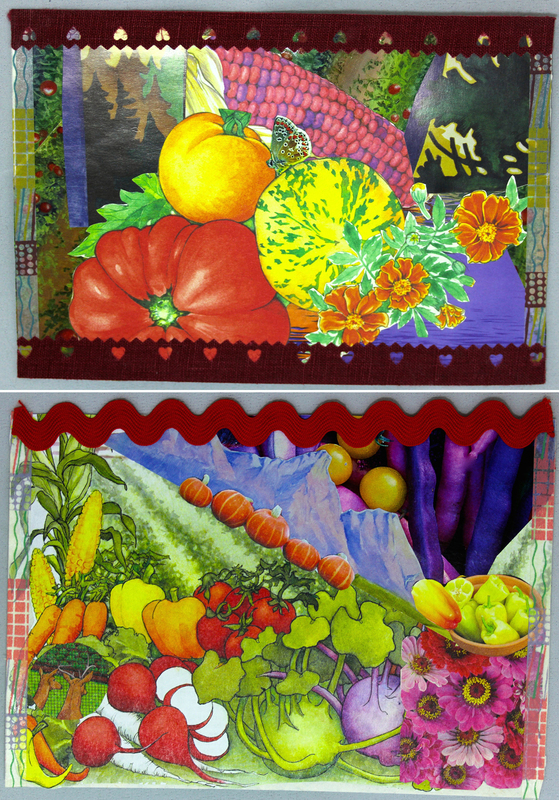 These colorful tomes are filled to the brim with the joy of the possible: grow tomatoes and potatoes on the same plant, try multi-colored carrots, royal red radishes, heirloom mustard, new squash peppers, and an apple named like a potato, knobbed russet. Really? 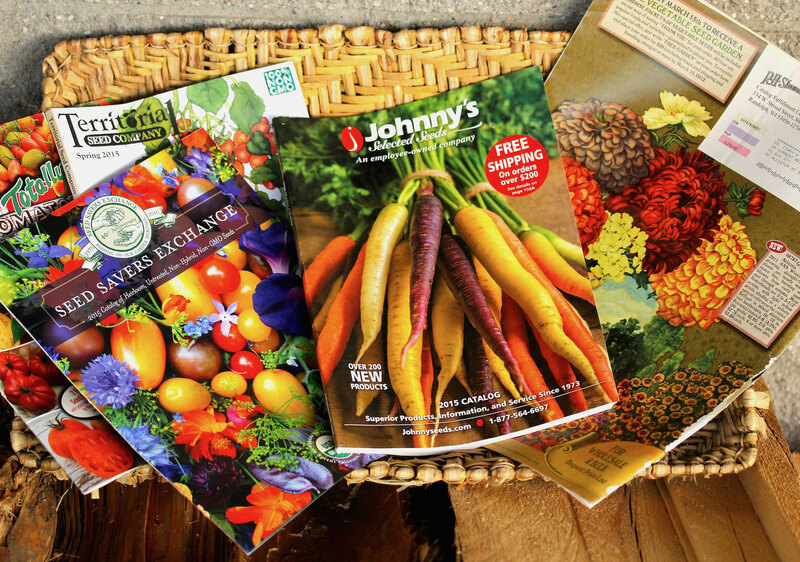 There is no end to the sensual excitement vegetable and flower seed catalogs bring! At one point, some years ago, the piles of saved seed catalogs were so high and abundant my family demanded a cleaning out. I was desperate to keep the most beautiful and colorful catalog pages to serve as inspiration for my garden plan. Torn-out pages quickly turned into further piles and my secret was out. It came to me one sleepless night that I could turn these spectacular photos of flowers and vegetables into pieces of personal expression! Torn photos of cabbages, tomatoes, hydrangeas, spinach, and carrots came together to form collages emulating the place I live. Potatoes become the Madison Mountain Range foothills. Chinese cabbage curly leaves easily portray Lone Mountain and neighbors. Corncobs stand tall as fence posts. Pieces of vintage bark cloth become the undulating features of windy meadows. My seed catalog assemblages have turned into a garden album of sorts buried from the eyes of others. 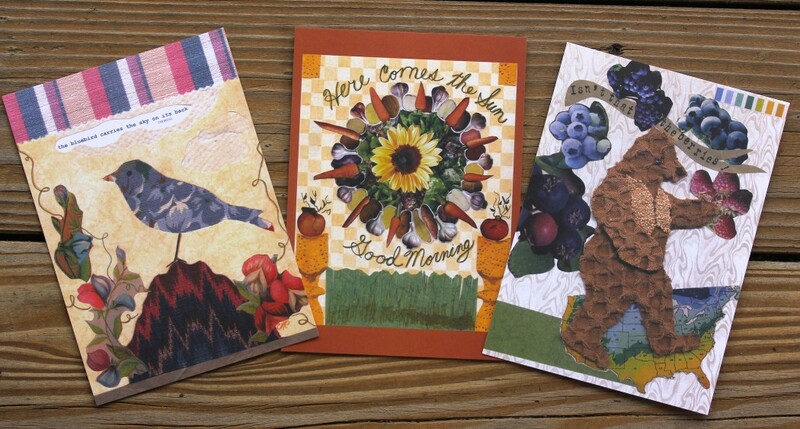 A few years ago, I decided to turn the collages into postcards to be sent as a New Year greeting to friends and family. 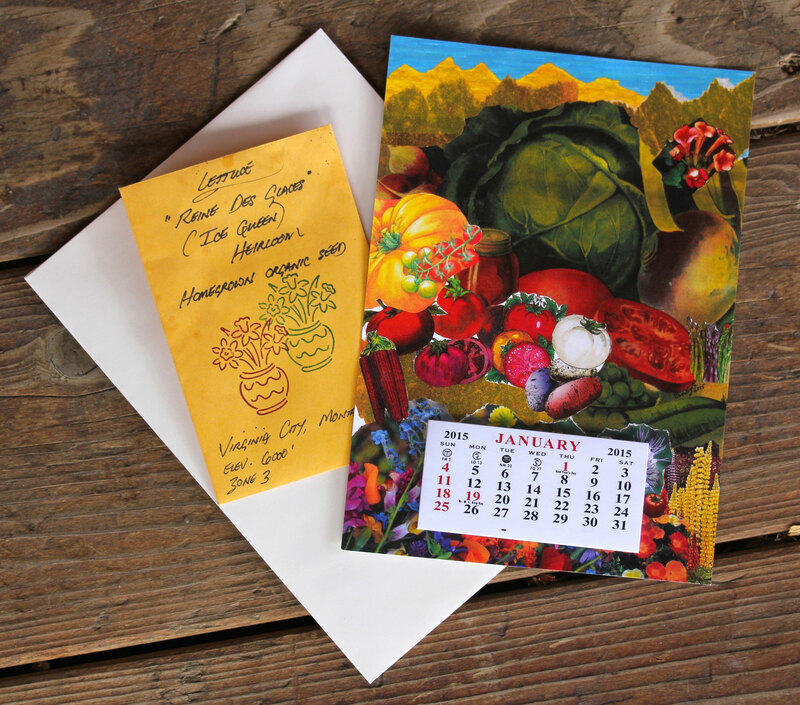 Each mailing includes a calendar and a package of heirloom lettuce seeds. I share as an annual reminder of our temporal and sensory connection to the dormant seeds of life that miraculously burst forth at Sap Moon time…a celebration of the joy of the possible!